1-1/4 hours North of the Toronto Airport. What's there: As a cross country ski resort, we have worked to make Highlands Nordic a year round business. In the spring and fall, we do outdoor education. In the summer we run day camps and of course, cross country skiing, snowshoeing and tobogganing in the winter. Highlands has 24km of both Classic and Skate cross country ski trails, and 7km of snowshoe trails. Use your own equipment or rent from us! Highlands have sizes starting at a children’s 8 and going up to an adult size 15. Ski Trails are groomed daily by first class grooming equipment. Our experienced grooming staff are also avid skiers and understand the importance of grooming excellence. 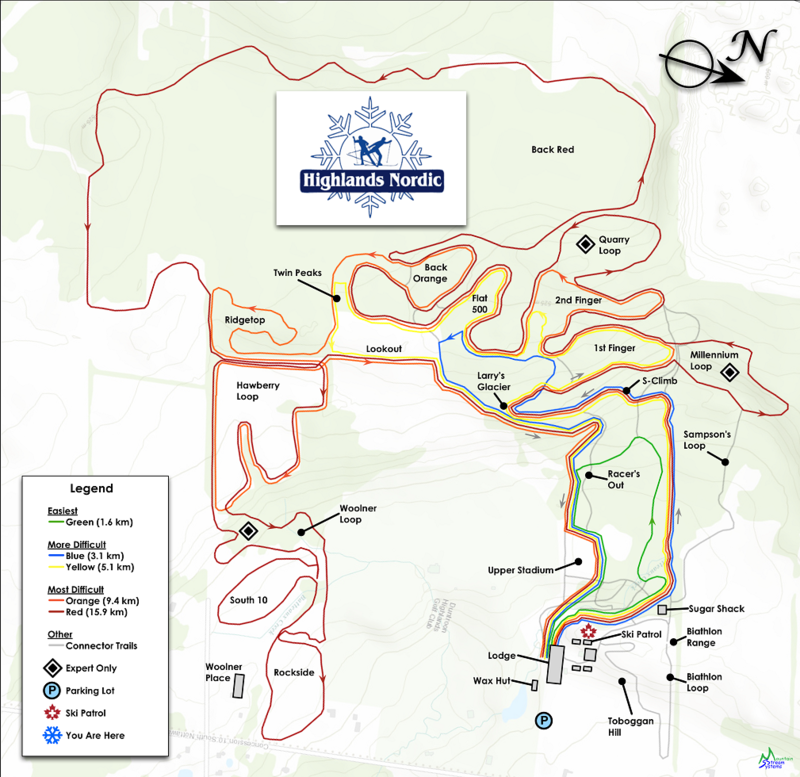 The Highlands trails are all 30ft wide and are groomed for both classic and skate skiing. Highlands wants to teach you how to ski properly no matter what your age or ability. We offer a variety of lessons by certified instructors with many years of experience. If you are a beginner, we offer a discovery ski lesson which includes rentals, trail pass and lessons that can last for 30 minutes to an hour. If you want to work on technique, we offer private lessons and allow for the addition of people to the lesson if you wish. Call in advance to set up a lesson that is best for you.